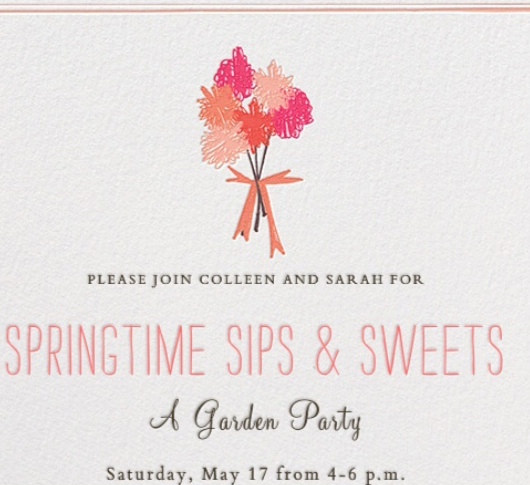 Sips and Sweets: Garden Party! 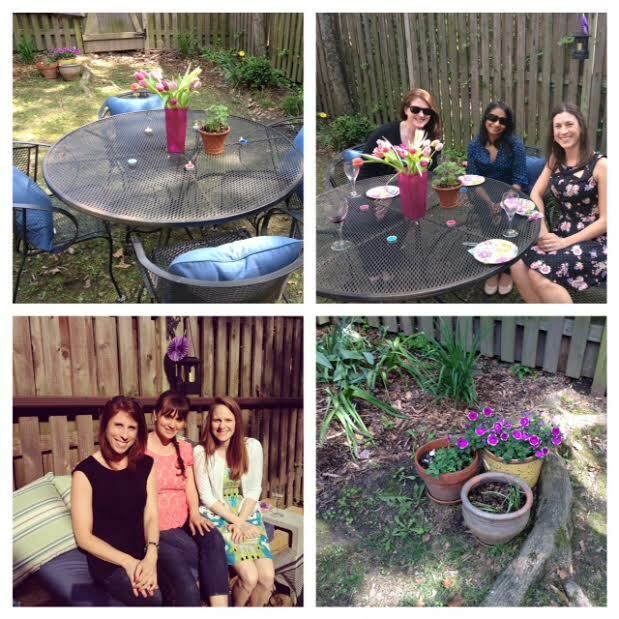 We hosted a lovely garden party–Springtime Sips and Sweets–at Sarah’s house in Old Town, Alexandria to celebrate springtime with our girlfriends. Here is the invitation we created using paperless post. We loved that it looked letterpressed and highly recommend using Paperless Post for invitations; they have the cutest designs! Colleen and Sarah Happy to Host! 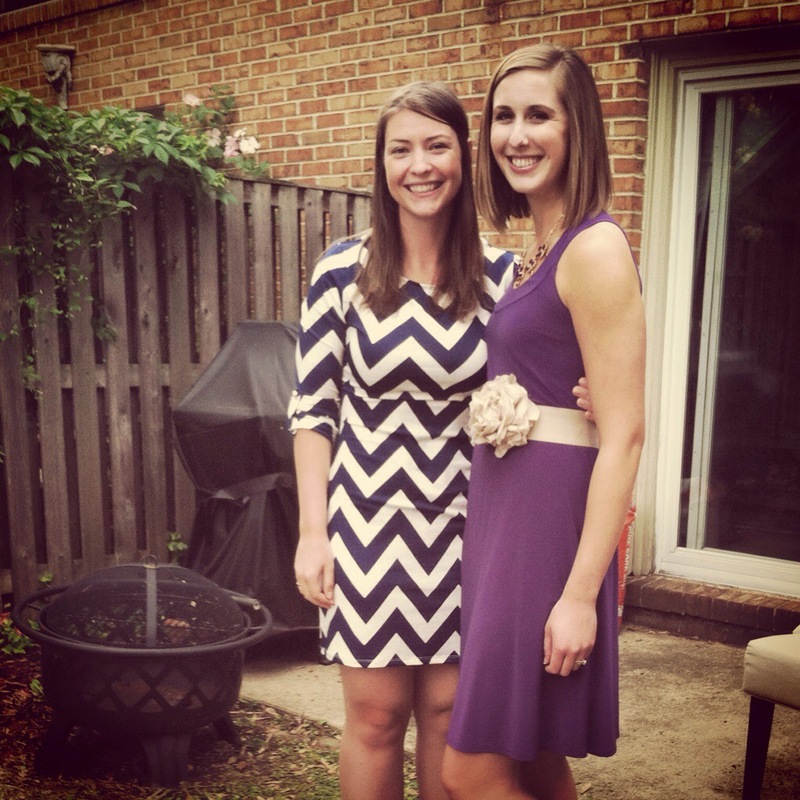 We enlisted our party planning consultant, Pinterest, to begin collecting ideas for our party. (Side note, are you following us on Pinterest? Click here!). We knew we wanted to incorporate a wine theme with the obvious garden theme, and found this adorable inspiration: tulips in wine glasses! See below for our inspiration and result. We cut the tulips down to a shorter length than we bought them, and used pipe cleaners to hold the tulips together. Any twine or string would have worked well. 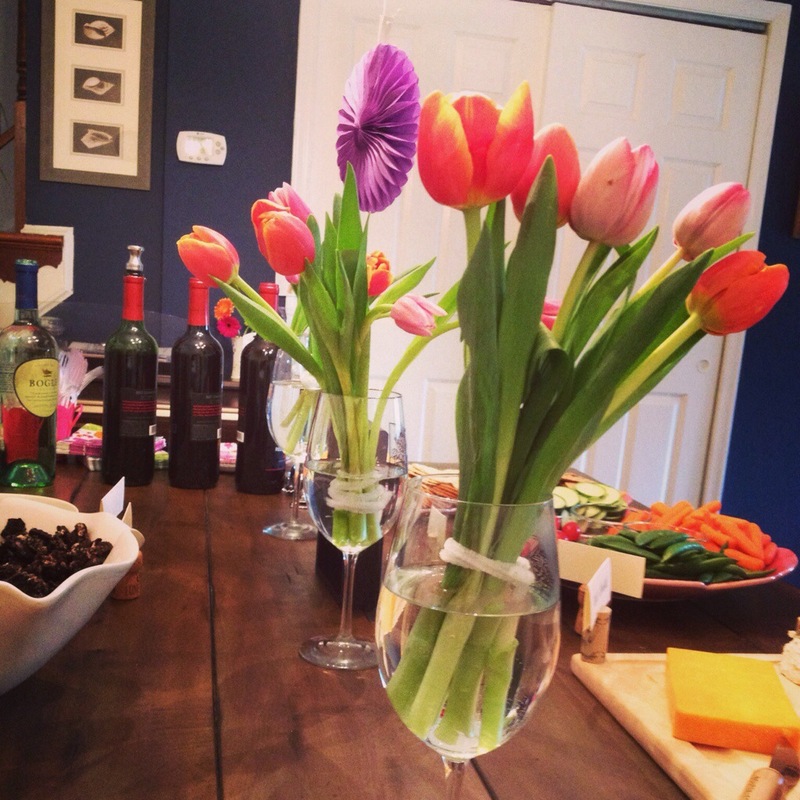 Pinspiration: Tulips in Wine Glasses! Result: Tulips in Wine Glasses! We used corks we had been collecting from previous sipping nights and cut small slits into them with a sharp knife. 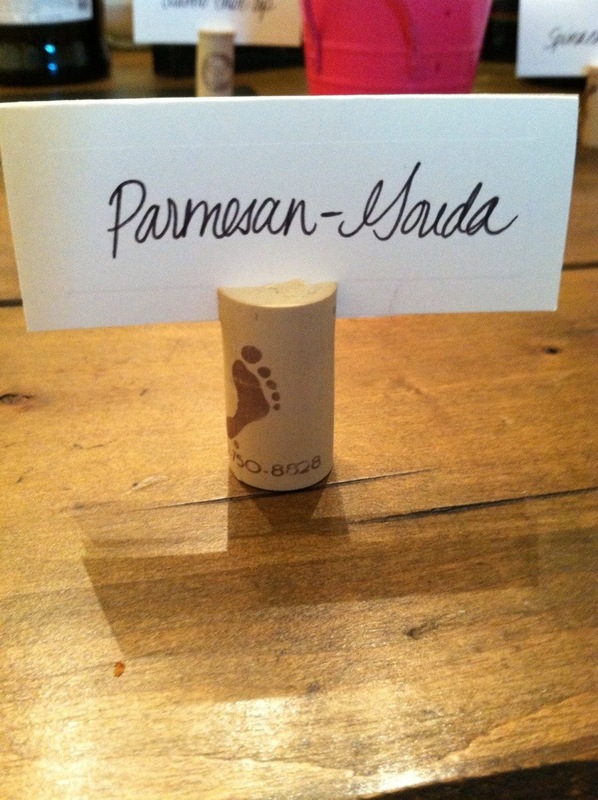 We bought inexpensive place cards at Michael’s craft store and voila! 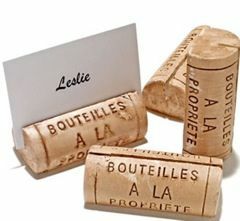 Tip: We found synthetic corks and champagne corks were most durable! Another fun idea we found on Pinterest was a wine-inspired game. We wanted a good way for our guests to interact. 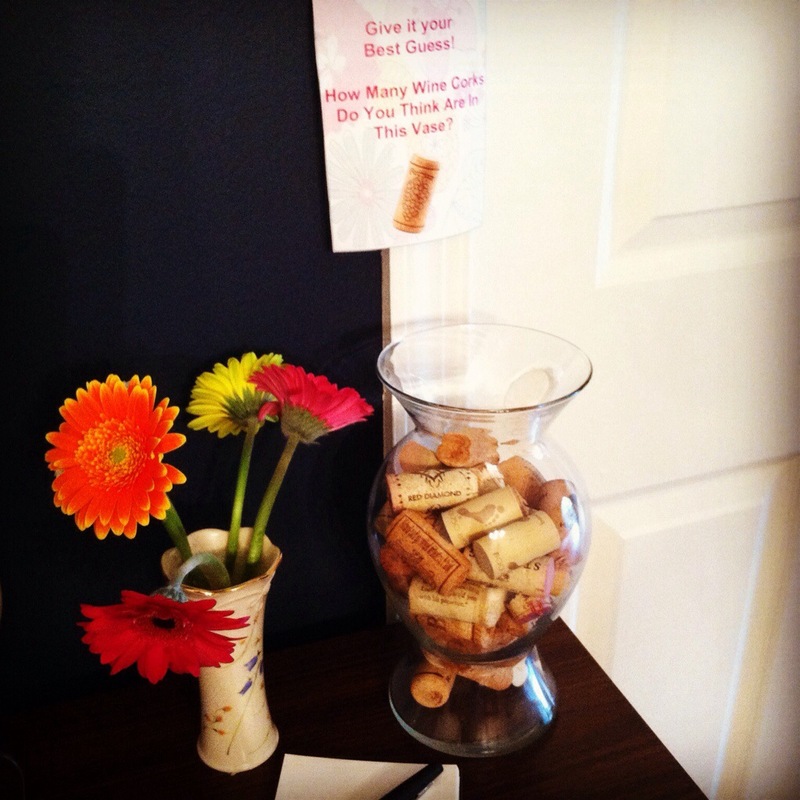 We had our guests guess how many wine corks were in a vase. The winner won a wine bottle topper. After dessert, we announced the winner of the cork game. Ellen won with a lucky guess of 35! There were 36 corks and we gained even more after the party we can use for future games and decor! On to the “good stuff,” literally. We decided to choose a white wine, Sauvignon Blanc, and a red wine, Merlot, to pair with cheese and desserts, and a sparkling wine to pair with dessert only. To be honest, we googled around a bit to come up with our selections, choosing wines that pair well with a nice variety of items to please everyone. Sarah went to Trader Joe’s knowing the types of wines she was looking for, but relied on the descriptions of the wines to guide her selection. The Sparkling: Michelle Brut, not too sweet or dry! We purchased the cheese at Trader Joes as well. Tip: Trader Joes has incredibly priced, high quality cheeses. In some cases, the same size package was almost half as expensive as in a regular grocery store! Smoked Gouda paired well with the Merlot. 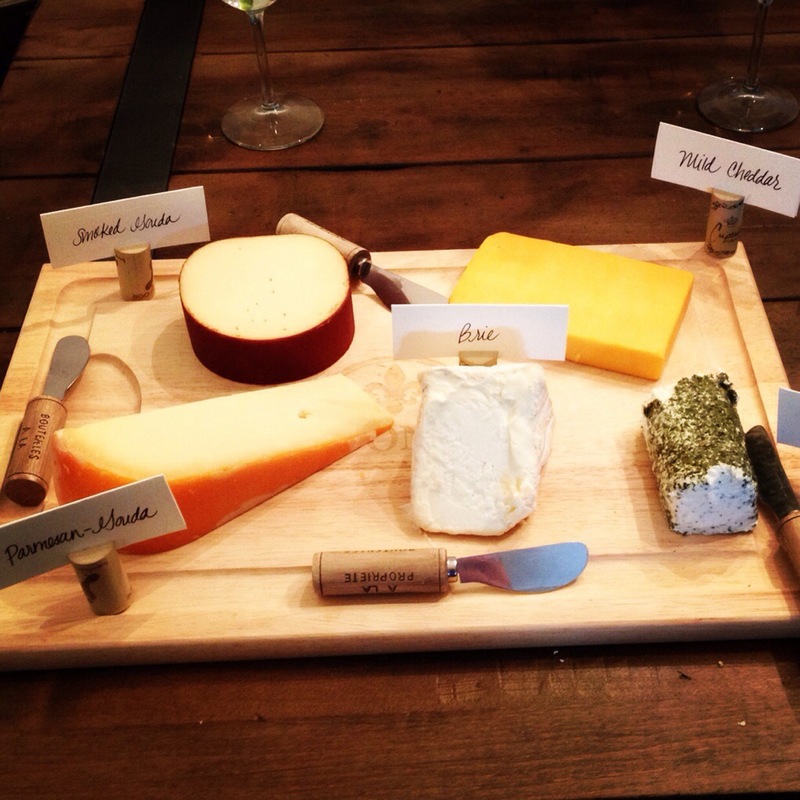 Parmesan- Gouda was the crowd favorite and was delicious with the crisp Sauvignon Blanc. Brie was the second favorite. The creamy and slightly sweet brie paired with the dry Sauvignon Blanc. Goat Cheese paired well with the Sauvignon Blanc. Mild Cheddar went great with the Merlot. 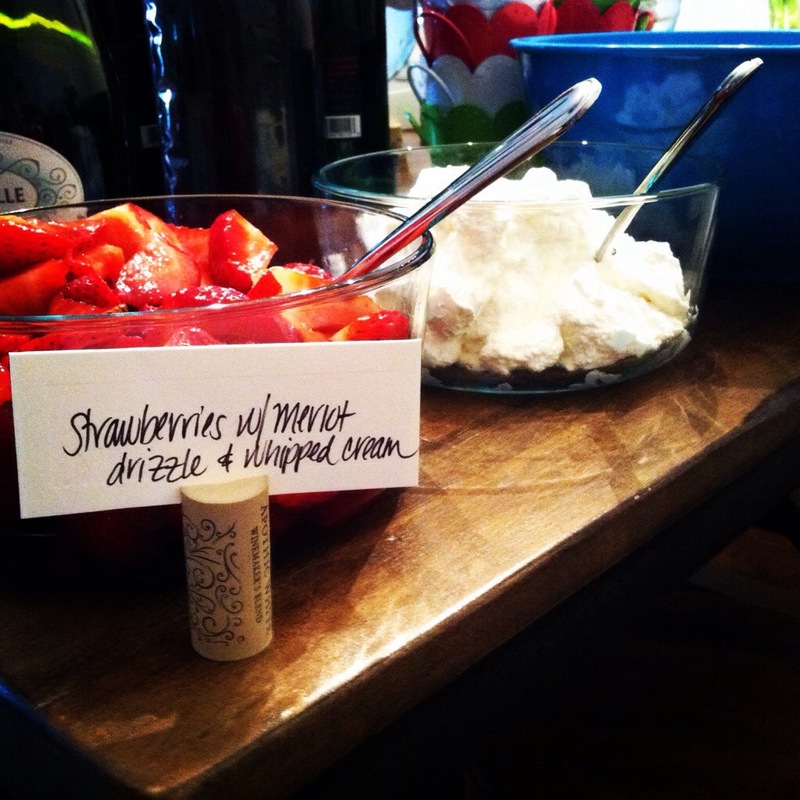 Ingredients for Strawberry Merlot Drizzle adapted from Yummly. * heavy whipping cream: whip cream with mixer and add a dash of vanilla and sugar until smooth and creamy. Be careful to not over-whip! Bring merlot, lemon juice, and honey to a boil in a sauce pan over high heat. Remove from heat; stir in vanilla. Drizzle over sliced berries. Strawberries with Merlot Drizzle and Whipped Cream. YUM! DIY Dirt Cake adapted from Lorie’s Mississippi Kitchen. 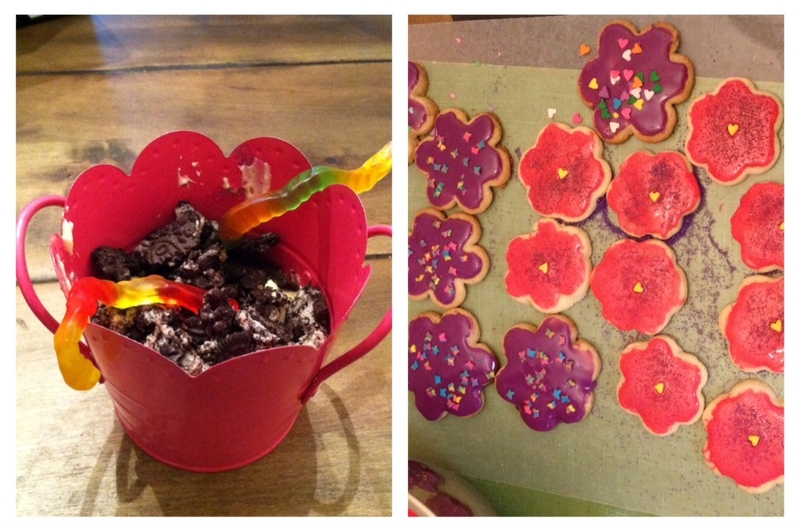 We traveled back to our childhood when brainstorming garden themed dessert ideas like Dirt Cake! We have to credit Lindsay Christians’ friend with the wine pairing for this dessert, which we found here. 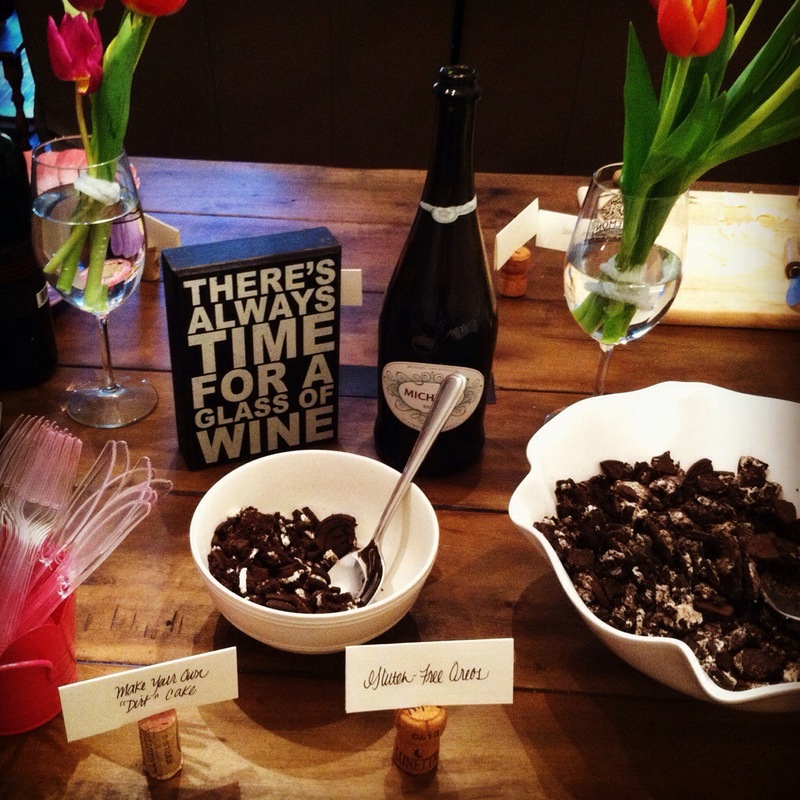 Apparently a dry sparkling wine pairs perfectly with crunchy cookies and creamy filling, and we completely agree. Whisk the milk and pudding together in a large bowl until smooth. Let stand five minutes. In another large bowl, beat the butter and cream cheese together with a hand mixer on medium speed until fluffy. Beat in the powdered sugar until smooth. Add the pudding and beat until smooth. Fold in the non-dairy whipped topping. Crush 1 package of cookies so that there are some fine crumbs, but also some larger pieces. There needs to be a variety. Crushing cookies is a great stress reliever! DIY Dirt Cake! Brings us back to childhood! Dirt Cake in Mini Flower Pot! We sent some springtime cookies home with our guests too! 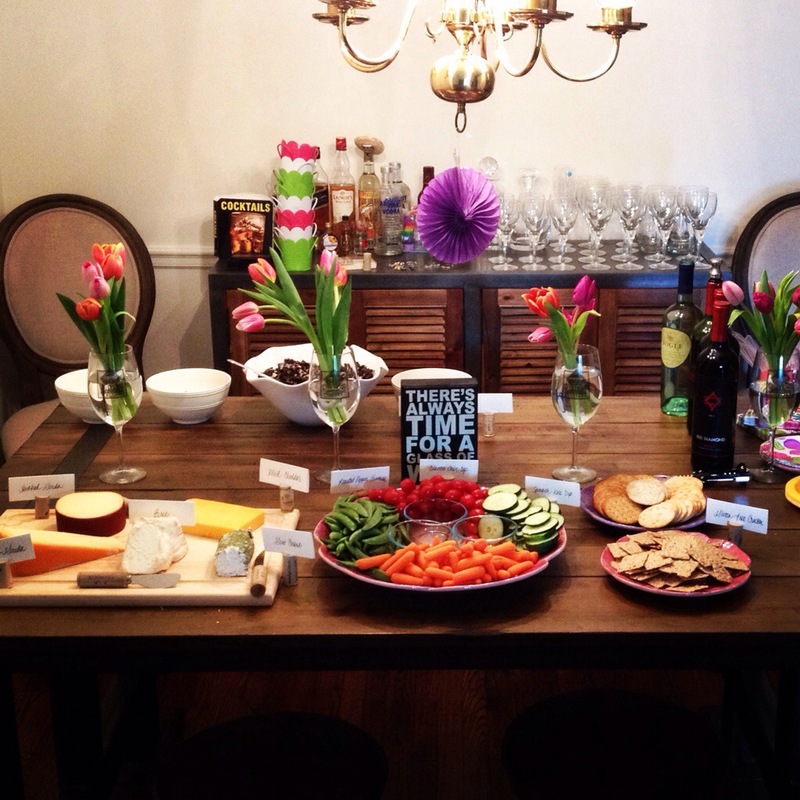 We had a great time planning our first party and catching up with our girlfriends. We can’t wait to host again! Happy Sipping and Sweet Making!! Lovely ladies in Sarah’s Garden! Gorgeous Cherry Blossoms in DC! 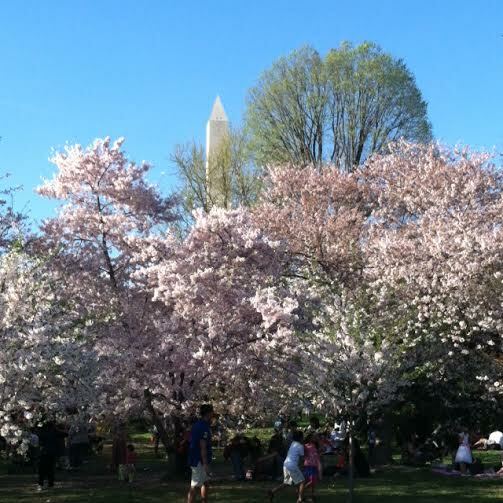 The Cherry Blossoms have bloomed in DC and springtime is in the air! 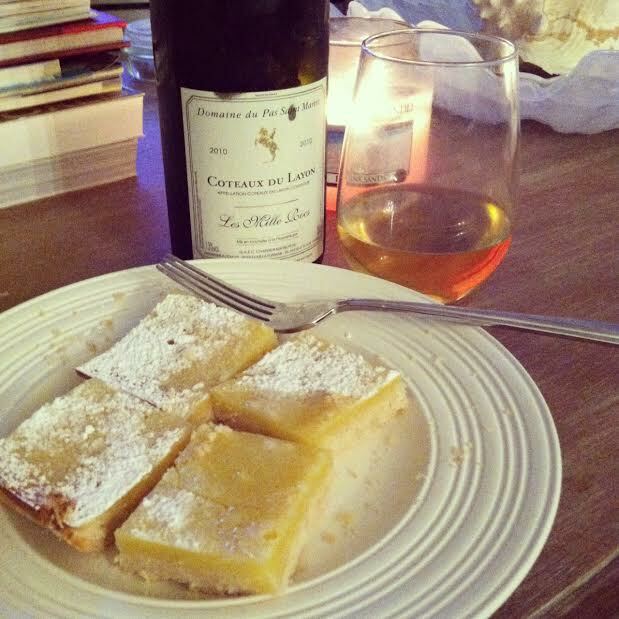 We decided to celebrate the first taste of spring by pairing a bottle of Couteaux Du Layon with a delightful and refreshing lemon tart. Colleen made a trip to the local wine store, Arrowine for to find the perfect dessert wine for our pairing. A wine specialist helped choose the 2010 Domaine du Pas Saint Martin Coteaux Du Layon bottle. She said this semi- dry sweet wine would pair well with the lemon flavors in our dessert. The light lemon flavors in the wine would create a balance with the tart without being too acidic. She had paired it with cheesecake in the past and said it is a nice wine to simply sip on. SOLD! Sarah hosted the evening at her house providing a lovely pasta dinner and the baking ingredients. 2. In a medium bowl, blend together softened butter, 2 cups flour and 1/2 cup sugar. Press into the bottom of an ungreased 9×13 inch pan. 3. Bake for 15 to 20 minutes in the preheated oven, or until firm and golden. In another bowl, whisk together the remaining 1 1/2 cups sugar and 1/4 cup flour. Whisk in the eggs and lemon juice. Pour over the baked crust. 4. Bake for an additional 20 minutes in the preheated oven. The bars will firm up as they cool. For a festive tray, make another pan using limes instead of lemons and adding a drop of green food coloring to give a very pale green. 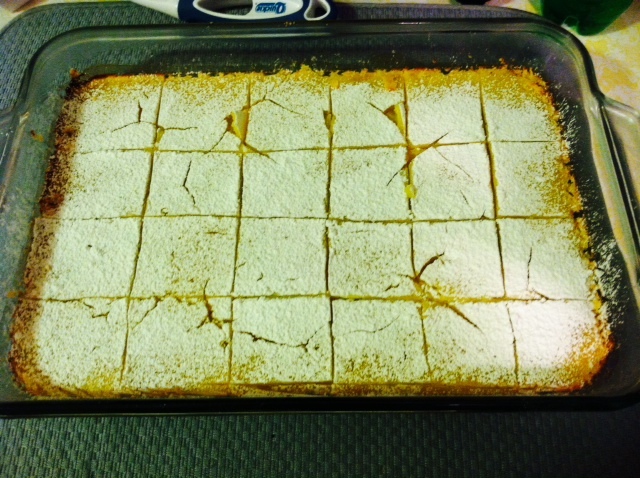 After both pans have cooled, cut into uniform 2 inch squares and arrange in a checker board fashion. 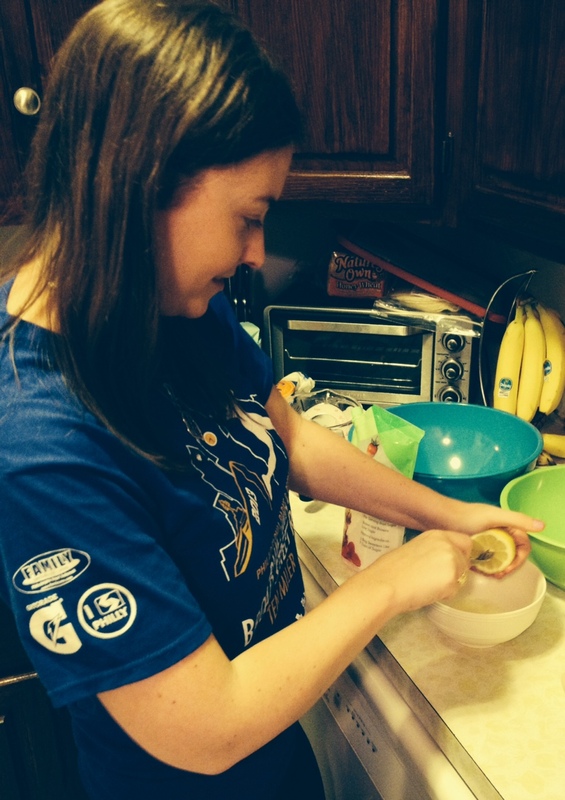 Squeezing lemons: Sarah saw this trick at a Mexican restaurant once and has used it in her own kitchen ever since. 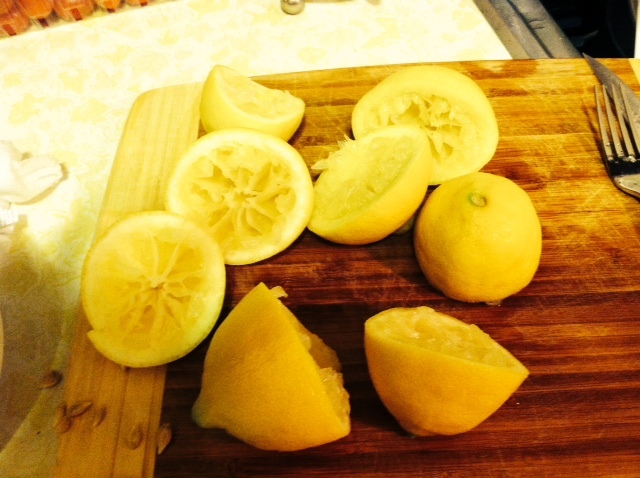 Cut the lemon in half, then use a fork to pierce the lemon while squeezing into a bowl or measuring cup. You get more lemon juice out of the lemon than if you only squeeze. Colleen demonstrates the lemon squeezing trick! When life gives you lemons make lemon tarts! When pressing the crust into the pan, make sure you really press hard! We didn’t in some places, and the bottom of the bars were crumbly and fell apart. User error, but something to keep in mind! They were delicious regardless, and beautiful, as demonstrated below. The color was bright, rich yellow, and reminded us of lemons! We tasted honey, lemon, and vanilla. It was light and sweet, but not too sweet, which we really liked. It’s a sippable wine and we will definitely have it again! Sneak Peek of Our First Event! We both invited a close girlfriend to share in a fun girls night out at a local wine bar. 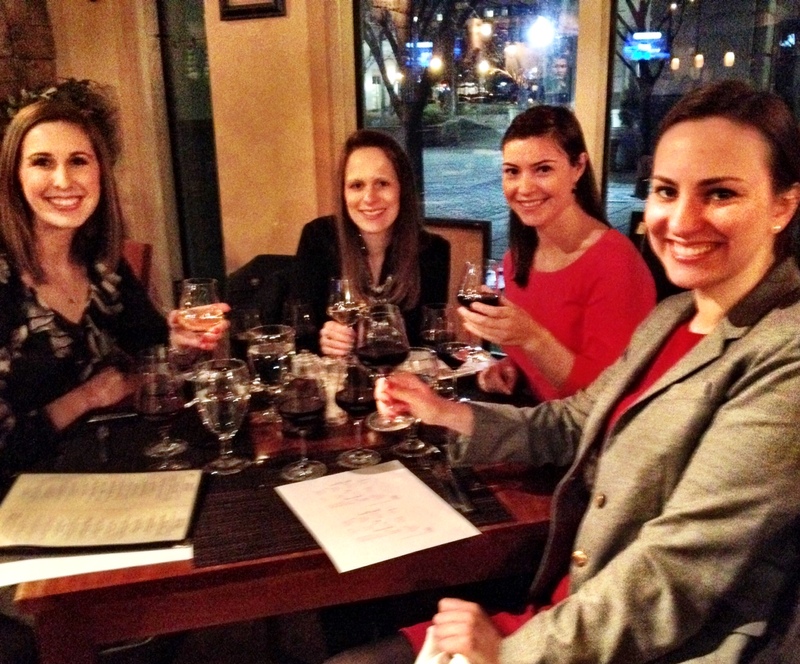 Four seems to be the perfect number for a group wine tasting in an intimate setting. Often wine bars are on the smaller side, making it difficult to accommodate larger groups. It is also nice to be able to catch up with everyone equally and not have many side conversations with friends. We selected Grand Cru Wine Bar & Bistro. It is tucked away in a small courtyard in Ballston, a neighborhood in Arlington, VA. The wine bar was cute and inviting- perfect for a girls night or even date night! One unique aspect of Grand Cru is that it is a wine store and a wine bar combined, so, as our waiter said, the wine list is “all around us!” In addition to ordering a glass or a wine flight, you can select a bottle from the shelf and pay a small corking fee to drink it there in the bistro area. We discussed what kind of wines we prefer. Caroline brought up a good point when selecting a wine when out wining and dining. She told us she tends to look for the region of where the grape was produced. Caroline’s go-to is usually an Argentinian Malbec, but if a Malbec isn’t available she will choose another wine from Argentina. Makes sense! We wanted to have a fun activity during girls night out, so Colleen printed out ‘A Sweet Tasting Shortcut For The Savvy Girl’ guide for the girls to use as a reference when tasting. Sarah and Caroline sipped on “The Primavera” flight. The Elena Walch Pinot Grigio was fruity and light. Strong notes of stone fruits–peaches–and some vanilla and oak flavors and smells as well. This was Caroline and Sarah’s favorite of the three. The Conti Speroni Barbaresco was a light red wine. Caroline and Sarah tasted plums, grass, and leather, and could easily taste the tannins. The texture was smooth and tannic, and much lighter than we thought it would be. We felt this was a great option for the wine drinker who doesn’t prefer white wines but wants something light in warmer weather. Sarah’s favorite wine while studying abroad in Italy was Montelpucciano, and the Cataldi Madonna didn’t disappoint. It has red berry and vanilla flavors, and was just a bit sweeter than the Barbaresco. Colleen and Christine sipped on “The World of Reds” flight. The Lomalta Crianza wine was creamy and balanced. Flavors included blackberries, plum with hints of oak. The wine was dry and very full in body. We tasted blackberries with hints of oak and toast. The third selection was the favorite in this flight. The wine was smooth and medium in body. We tasted blackberries, oak, and vanilla. Colleen is a fan of Syrah and would have gladly poured a full glass. Keep your group on the smaller side. Check if there are any happy hour specials. We missed HH, but there were specials! Check if your local wine bar takes reservations. Grand Cru gets bonus points for being able to making online reservations via their website. If possible, try to have the group try different wines. We found it worked to have two girls try the same and the other two girls try the same so there was someone to compare thoughts with! Have fun!!!! 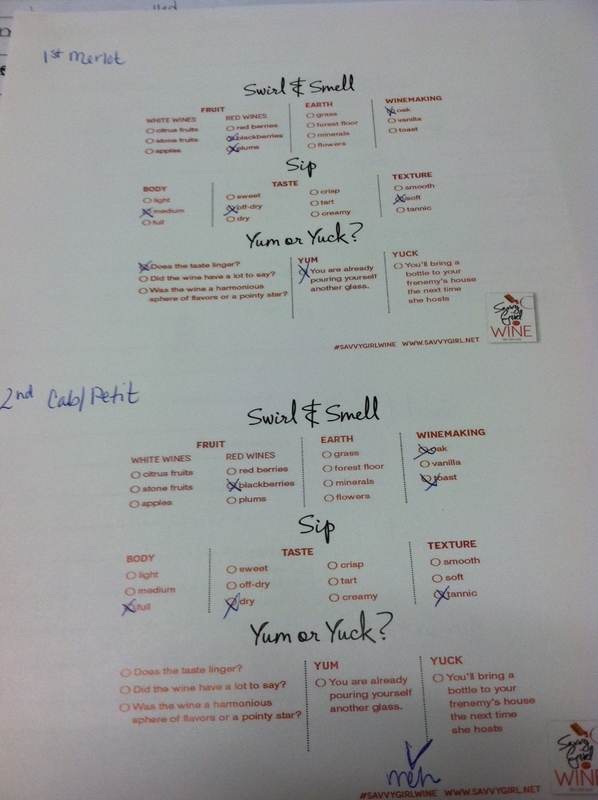 Don’t take it to seriously when comparing different wines! Everyone has a unique taste.